The natural world can be a very strange place. WTF evolution?! is a great site that takes a humorous look at some of nature’s weird turns. Today I am going to celebrate some of nature’s curiosities by playing a game. Some animals are so weird they look like combinations of other animals. For instance, the platypus is often said to look like a cross between a duck and a beaver. I will provide a fictional cross between a set of animals. See if you can guess what real animal it might be. Then come back later to see what animal it is and description of what makes it such a curious animal. 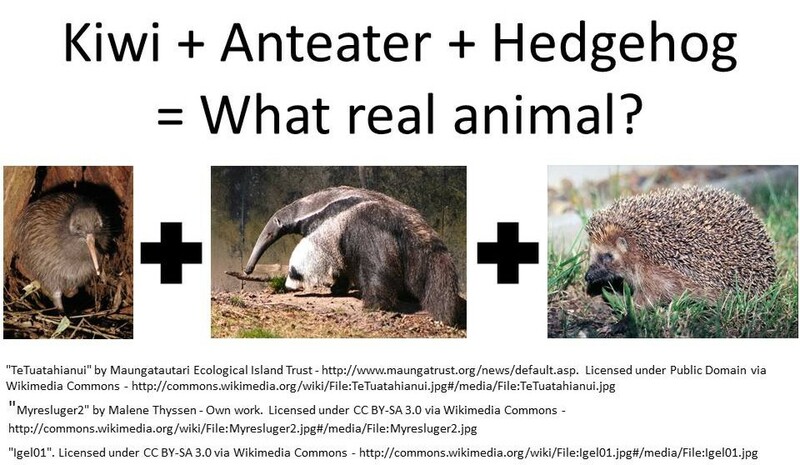 For today’s cross, what might you get if you cross a kiwi (the bird, not the fruit) with an anteater and a hedgehog? I will give you a hint. It is an extant animal, so you can rule out any fossil animals. By paleoaerie in animal crosses on May 14, 2015 . Indeed it is! For those who are not familiar with them, echidnas, also known as spiny anteaters, are monotremes, which are egg-laying mammals. Congratulations on putting the traits from the animals together to come up with this very unusual animal.